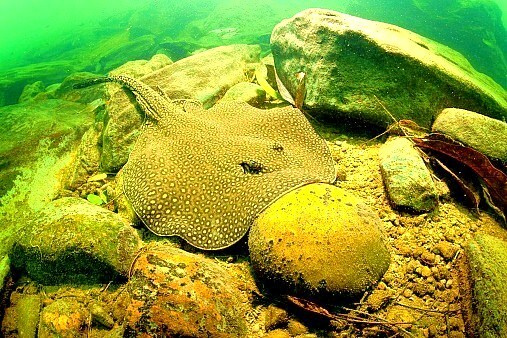 Remarkable for its habitat, the ocellate river stingray is one of a small group of rays that evolved in freshwater from a marine ancestor. The first part of the scientific name reflects this lifestyle, potamos means ‘river’ in Greek, while the second part, trygon, means ‘three angles’, and may refer to its body shape. The body of the ocellate river stingray is an oval disc, with a greyish-brown upper surface patterned with distinct yellow-orange spots, and a white underside. While the ocellate river stingray is a beautiful species, it is much feared for the single spine borne at the tip of the robust tail, which is capable of delivering a painful sting.